Aromatherapy is especially good for when something is out of balance physically or emotionally. It works equally well for conditions beginning to manifest as it does for chronic or acute conditions. Essential oils can be used through a diffuser putting them into the air, applied directly to the body using various techniques, put in bath water, sniffed straight from the bottle, or steamed to inhale. You can buy high quality commercial oils or make your own. Here are a couple of aromatherapy recipes for specific uses. Anti-Viral: Use cinnamon, pine needles, lemon, and thyme against flu and other viruses. Mental Clarity: Use rosemary, basil, thyme, ginger, and clove. Harnessing the magical powers of various herb plants is another alternative healing resource. You can buy herbs, gather them in the wild or grow them yourself. Herbs can be dried, used in infusions, boiled to make decoctions, made into teas, used to make tinctures, steamed for inhalation of the scent or burned. Purifying is one of the situations in which herbs may be used by burning them. Sage, cedar boughs and lavender flowers are some of the most common herbs used in this way and for this purpose. Any herb can be burned, but when using herbs it is best to have a thorough understanding of the plants and their properties so that you can select the best one and the best delivery method for the situation. This is just a small taste of what you will find in the Energy Healing for Self and Others ebook. If you are ready to start uncovering the mysteries of energy healing and alternative healing techniques, this is the ebook for you. If you've taken our online Basic Magic Courses 1 and 2, and are ready for the really serious (and super fun) magical knowledge of the Tarot, Spellwork, and Simulacra, then you are primed for Basic Magic 3. This course covers these topics and more in great detail. Not only will you learn to throw a wide variety of Tarot readings, but you will learn to build on those readings to develop spells. This course also offers much more bonus knowledge just for the fun of it! To give you an idea of what this course has to offer, here is some of the information in the class that covers Celtic Cross readings. This type of tarot reading is also called the Gnostic Cross and is best used to get a quick personality profile or character sketch of an animate being like a person or animal, but is not useful for situations or specific questions. 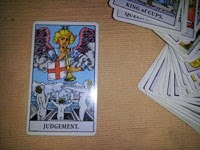 For those more specific situational readings a 12 Card reading is needed. There is plenty of good information you can get though by doing a Celtic Cross reading. For example, if all the base cards in the reading show up reversed, it could mean this is not a good time to do a reading on this person because they are at a place in life where all the probabilities for them are equal and until a change happens in their life the reading wouldn't be meaningful. Similar to 12 card readings, the cards in a Celtic Cross reading are thrown with a base card and a second card over it. The base card represents the general situation and the second card represents more specific details of the situation. The signifier card is the card that represents the person or animate being the reading is for. The Cover and Cross on the signifier give you an overview or summary of the whole reading. An upright Cover card means it represents the positive summary of the reading, making the Cross card the negative summation. If the Cover card is reversed, it represents the negative summary and the Cross card represents the positive. Just by looking at the Cross and Cover cards you get a very quick summary of what the whole reading will show you. Above – This position represents unrecognized potential that may or may not come to fruition. Comparing these cards to the cards in the Outcome position can give you information about if this potential is likely to manifest by the cards in these two positions being similar. Behind – This position show what the person has left behind or wants to be rid of or something that happened in the past that pertains to the reading. Below – This is a foundation position and the take-off point for the reading that gives you the bedrock of this person's life. Ahead – This position indicates the future according to the perception of the subject of the reading. It doesn't mean it is necessarily true, just how they are looking at the future and their belief or thoughts of what will happen. Outcome or Far Future – The cards in this position give you a short basic look at the outcome of the reading if nothing changes. Since one of the reasons for doing a reading is to make a change of whatever you don't like, this outcome is definitely not set in stone. It merely shows the probability of what will happen if no changes are made. Hopes/Fears or Near future – A reversed base card in this position is showing you this person's fears and that they live more in fear than hope. An upright base card here tells you their hopes and that they have an optimistic outlook. Environment or Near Past – This position covers the time from the near past to the present and shows how the subject's environment has affected them in a positive or negative way. It also gives information on if factors in the environment are helping that person or hindering them. Self Image or Far Past – This position gives you an idea of the subject's self-image derived from their history. If it is reversed then the subject's view of him or herself is wrong and the opposite is actually the truth. As you can tell there is lots of information you can get that can magically change yourself or others by doing a Celtic Cross reading. Basic Magic 3 not only teaches you how to do these readings, interpret the cards and prepare your tarot deck, it also teaches you to do the more detailed 12 card readings and then how to use the tarot for spellwork. This is a fascinating form of divination that can truly help you find answers and solutions to those questions and problems that arise in your life. If this sounds good to you, then take a look at our Basic Magic Courses and start your magical journey today. No matter how long you have been practicing the magical arts, sometimes your techniques just go wonky--for no explicable reason! Don't worry, it happens to most practitioners from time to time. If you need some magical Rx, consider signing up for our twice-monthly magical newsletter. 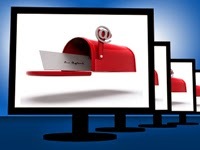 The newsletter covers a wide array of topics, and we also attempt to answer reader questions when possible. Or, visit our FB page, magical library, or blog. Any of those places might have just the magical prescription you're looking for! To give you an idea of what you're missing if you aren't signed up to get the newsletter, here's some excerpts from newsletters sent out so far in 2015. These first 3 are probably things you are at least a bit familiar with so let's talk about the 4th – changing one small habit. According to Universal Law "A small change in the present will create a larger change in the future." By changing a small habit in now-time, you pave the way for larger changes in your magical life in the future. Using your psychic abilities will be a change in your future, so prepare yourself by changing some small things now. By practicing this you will change your habitual thought patterns to allow new ideas and inspirations in the future and by sticking with small changes you won't run into resistance. All you have to do is find small changes to make that you don't usually think about. For example, use a different hand from the one you usually use to brush your hair, teeth or open a door, wear your socks wrong side out, sit in a different seat than you usually do or get up on the opposite side of the bed from the side you usually do. Anything that is different and a small change that you can make will work. No one else has to know about these changes if that is something that would make you self-conscious. Most of these changes will not be noticeable to anyone but you. Similarity - physical likeness creates a psychic likeness and resonance, the degree of resonance being directly proportional to the degree of physical likeness. Identity - a physical part (piece or component) remains part of and contains the psychic whole, unless special magical operations are done to alter this. Relationship - once there has been physical contact, there is continuing psychic contact, unless special magical action is taken to break the contact. Symbols - a symbol may be created for any object, process or other phenomenon. Substitution - in a magical or psychic or spiritual operation a symbol may be substituted (in the operation) for any object, process or other phenomenon. Contagion - something done to a part, a likeness or a symbol that produces a similar effect on the divided-whole, the likened or the symbolized. Duplication - an effect created in the physical is duplicated in the psychic and an effect created in the psychic is duplicated in the physical ("As Above, So Below"). So whether you are an experienced practitioner or just beginning your journey into magic, you'll find something new to learn, something to refresh your memory, or something to inspire or re-inspire you to add to your magical practice. Information, magical techniques, exercises to try out for yourself – they're all here for you at no cost. All you need to do is sign up with your email address and twice a month these magical treasures will appear in your inbox. When we say "Try a voodoo doll," we don't necessarily mean that you should get a voodoo doll and stick it full of pins. There are much better ways to magically use voodoo dolls. For instance, if you have a spiteful neighbor who keeps infringing on your sacred space, you can use voodoo, a specialized branch of magic, to keep your neighbors and their junky energies on their own property--literally! Have an angry boss? You can use magical voodoo to ensure that he or she never visits your office when angry. No pins or needles needed. Get the scoop in our Voodoo ebook! After all a voodoo doll is simply a magical simulacrum. A simulacrum is a likeness of an object, person or thing that you want to affect magically. Once you key the simulacrum to a particular person, object or thing, whatever you do to it also affects that which it is keyed to. This is very useful for doing healing and other magical work on someone who is not physically present. You can make a simulacrum or voodoo doll of that person, key it to him or her and use magical healing techniques on the doll that will work on someone across the country just like if you were doing those techniques on them with them in the same room. A voodoo doll is often used as a simulacrum for a person because according to the Law of Similarity, the greater the likeness (between a simulacra and what it is keyed to) the greater the resonance or connection. For this reason, photos and pictures of actual people also can make good simulacra. The doll just sometimes makes it easier for techniques such as those for healing because it gives you the parameters of a body with arms, legs and so forth to work on. Once you have a simulacrum picked out and have it keyed to the person that is doing something to anger you, there are several magical procedures you can do. This gives you an alternative to forming a negative reaction or getting in a physical or verbal fight with that person. One magical technique for dealing with someone harassing you or adding strife to your life is to put the simulacrum of them in your Chalice. This will confine them and you can even talk to them on a spiritual or psychic level to reason with them. You can also use a keyed Plate and Chalice to separate the two of you. To do this you will need a simulacrum for each of you, put the one of yourself inside the Chalice on the Plate and put the simulacrum for the other person on the Plate but outside the Chalice. Envision the person on the outside trying to get to the person on the inside and unable to do so with their energy bouncing off the Chalice. In the real world this will cause the person outside to leave the protected person alone. Another magical technique is to put the simulacrum of the person that is exhibiting negative energy or doing harm to you or your sacred space under the Chalice. In this case envision their negative energies bouncing back to them inside the Chalice unable to get out into the world. If this is a person that is extremely negative or powerful you can line the Chalice with aluminum foil (shiny side facing the inside of the Chalice) and you can deal with even more extreme situations by writing verses that program the shield you've created to bounce back certain kinds of energy and only letting positive, uplifting or loving energies out. For both these operations you can use a regular Chalice and Plate, the Water tool and the Earth tool respectively, or key a cheese dome or cake dome with a matching plate like you would a Chalice and Plate and use them. That gives you a larger tool to work with that can accommodate a larger simulacrum. If you don't have a magical Chalice and Plate available you can use a quick shield method without them. Key your simulacrum to the person you want to affect and use your finger starting at the top of the simulacrum to start tracing a downward spiral in a clockwise motion going around the simulacrum twice. This makes a dynamic shield and starts it moving. You can also envision the unwanted behaviors or energies bouncing off this shield unable to escape into the outside world. So next time you face a situation like this, don't get mad, don't get even, just get magical. Magic can solve so many of our everyday problems and let us live the lives we want to. 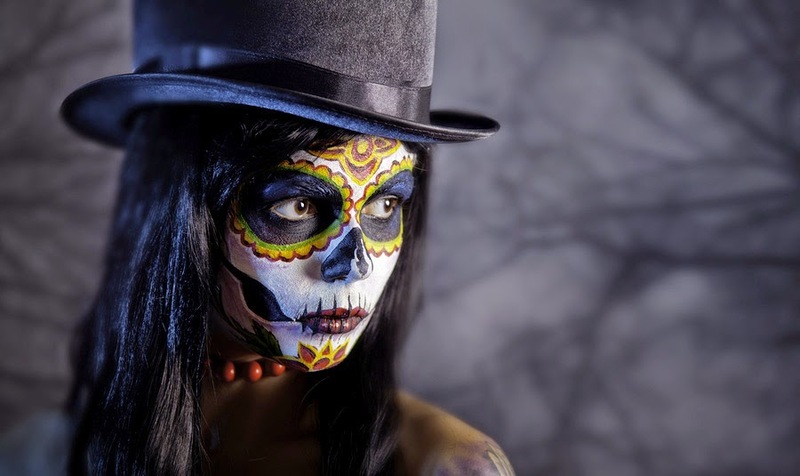 For more great voodoo magic techniques and information check out our How To Do Voodoo ebook. Ever wanted to learn how to really use the Firebowl, Wand, Athame, Chalice, and Plate? Then Basic Magic 2 is for you. This 10-lesson course covers the basics of each of these magical tools, from choosing or making the perfect tool to personalizing, using, and storing that tool. The information is simple yet effective, and builds on the knowledge from Basic Magic Part 1, which covers the four magical elements of Air, Fire, Water, and Earth. By using magical tools, magical practitioners can affect situations on many levels, ranging from the personal level to the global level. For example, it is easy enough to put up a personal shield around your body with your hands, but for a larger shield such as around your entire property, a magical tool such as the Wand or Athame makes the job much easier. Along with the magical tools associated with each element there are other useful tools such as the Firebowl, pendulum, dowsing rods, sun crystal, tarot cards and more that are needed for such magical techniques as spellwork and divination. Some of your magical tools you will be able to make yourself like the Wand and Firebowl and others such as the Athame and Chalice you will need to select and purchase. The pendulum is one of your magical tools that you can choose to buy or that you can make yourself. In the Basic Magic 2 course you will not only learn what tools to get or make and techniques to use them for, but also how to turn simple things such as a cup or plate into magical tools. This is done by keying, charging and/or training the tools. In the case of the pendulum, here is an exercise you can try out to make a pendulum yourself and then train it for magical use. To make a pendulum you will need a lightweight object and a chain or some type of string to hang it from. You can use a paper clip, small rock, earring, pendant, small medallion, crystal, talisman or other similar small object. If you use a crystal, use an amethyst, and store it in a pewter box to protect it from negative energy. Don't use Aurora crystals, which have been treated with petroleum. If you hang your pendulum on a chain, use a silver chain as it is more stable energetically. You can also hang your pendulum on any kind of natural fiber such as cotton or silk, horse or human hair or leather. Make sure the pendulum is on a long enough chain or string to swing freely. 1. First cleanse your pendulum with smoke. The smoke from burning pine resin and sage works well. Just hold the pendulum over a column of smoke from your firebowl until the smoke begins to "stick" to it. 2. Next, your pendulum needs to be keyed so that it responds to your energies. To key it, hold your pendulum in your dominant hand (the hand you write or point with). Flow energy into the pendulum for a minute or two, or until it grows warm and tingly. 3. Begin training your pendulum by establishing its yes and no directions. 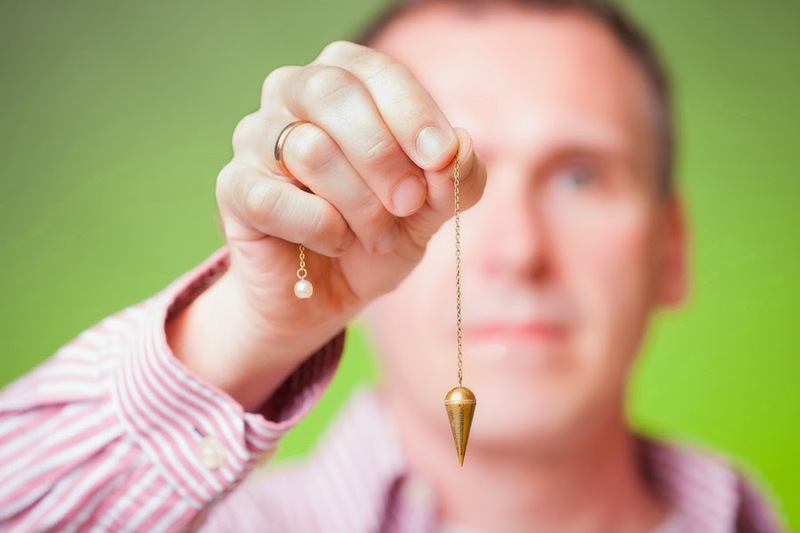 Decide if you want your pendulum to indicate "yes" with a vertical or horizontal swing. The "no" indicator will be the opposite of the "yes" indicator (if "yes" is a vertical swing, then "no" is a horizontal swing). Hold your pendulum suspended from your dominant hand. Rest your elbow on a table or your knee to stabilize your hand and swing your pendulum in a gentle clockwise circle telling it, "Show me yes." Wait for the pendulum to settle into the proper swing (whatever direction you chose). If it doesn't, ask again. Once your pendulum consistently swings in the proper direction for "yes," use the same process to ask it to show you the proper swing for "no." 4. Now you are ready to start training your pendulum to give you actual answers by practicing asking questions about short futures. Ask yes/no questions that can be verified in a 15 to 30 minute time frame. For instance, at the end of the work day you might ask your pendulum, "Will my roommate be home in the next 20 minutes?" Verify the correctness of your pendulum's answer, and then ask another question. In the beginning, it doesn't matter whether your pendulum gives you the correct answer or not, this is just the practice period and giving your pendulum a lot of practice is the important thing right now. The more your work with your pendulum, the more accurate it will become. Don't get obsessed with the "rightness" of the answers during this training period. Try making your own pendulum and practicing with it. Then when you are ready to move on to other magical tools, the Basic Magic 2 course is waiting for you online to take in your own time on your own schedule.